This is an entry about a man who has made a real difference in his community over the course of his lifetime, and who attributes his successes to a year spent in the United States. We had the pleasure of meeting Mr. B.P. Shresta of Dhulikhel, Nepal during a two-day visit to his hometown set on the eastern rim of the Kathmandu Valley. We were introduced to B.P. 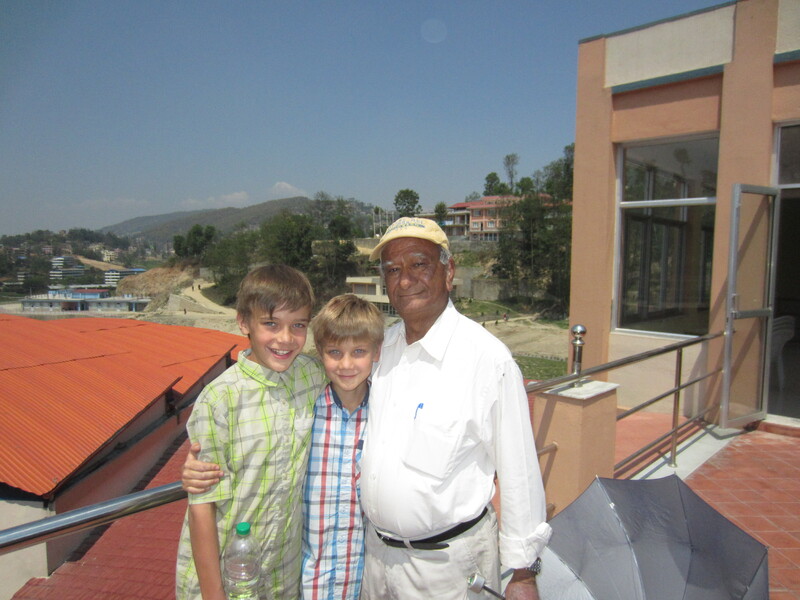 by our family member, Dr. Jerry Bunker, who spent some time in Dhulikhel practicing medicine. “Bunker” (as B.P. fondly calls Jerry) and B.P. became friends and have maintained that friendship over the years and distances. We benefited greatly from the Bunker-B.P. connection when we contacted B.P. 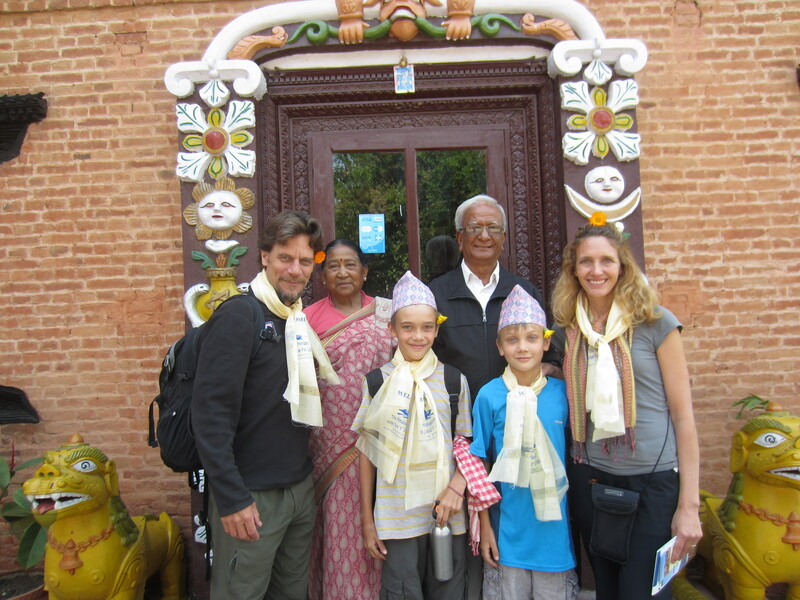 and were invited to spend time with him and his family at their hotel, the Himalayan Horizon, named for the magnificent mountain views from the rim of the valley. Clouds obscured the views most of the time we were in Dhulikhel, but meeting B.P. and hearing his story more than made up for the mountain-less scenery. Upon his return, B.P., seeing that those same hippies were starting to visit Nepal and needed lodging, started a four-room guesthouse with no indoor plumbing. By the time we visited Dhulikhel, he’d built the Himalayan Horizon, a four-building compound with a conference center and 60 high quality guestrooms (the nicest we’ve stayed in on this trip). But B.P.’s commercial activities were only the beginning of his contribution to Dhulikhel. A true visionary, B.P. has been able to see things both as they are and as they could be. He started with a municipal water system. In the country with the second largest reserve of freshwater in the world, Nepal’s water distribution system is abominable. In the pre-B.P. Dhulikhel water was hauled in buckets up from the valley. In post-B.P. Dhulikhel a German-engineered water system brings water from a spring 14 kilometers to the south supplying the townspeople with water at the twist of a tap. Around this same time, B.P. began to engage in politics, serving as the mayor of Dhulikhel for 14 years. During Bunker’s time in Dhulikhel, the absence of regular health care services was noted and quickly remedied by the establishment of a small clinic. It soon became clear that the clinic was not sufficient to fill the health care needs of the community and B.P. set out to organize and seek funding for the building of what now stands on the slopes of Dhulikhel: the state-of-the-art Dhulikhel Hospital. The service area for this hospital stretches across a quarter of the country, and it (along with the water system) has come to be regarded as a model for other communities in Nepal. Not only does Dhulikhel Hospital serve patients, but it is also a teaching hospital for the training of health care providers pursuing their degrees at yet another B.P. institution. Yes, you may have guessed it, B.P. was also a primary mover behind the establishment of Kathmandu University: a 3,500 student, Dhulikhel-based university [despite the name] offering undergraduate and graduate degrees mostly in science and technology, areas specifically chosen to fill recognized gaps in the offerings at other universities in the country. 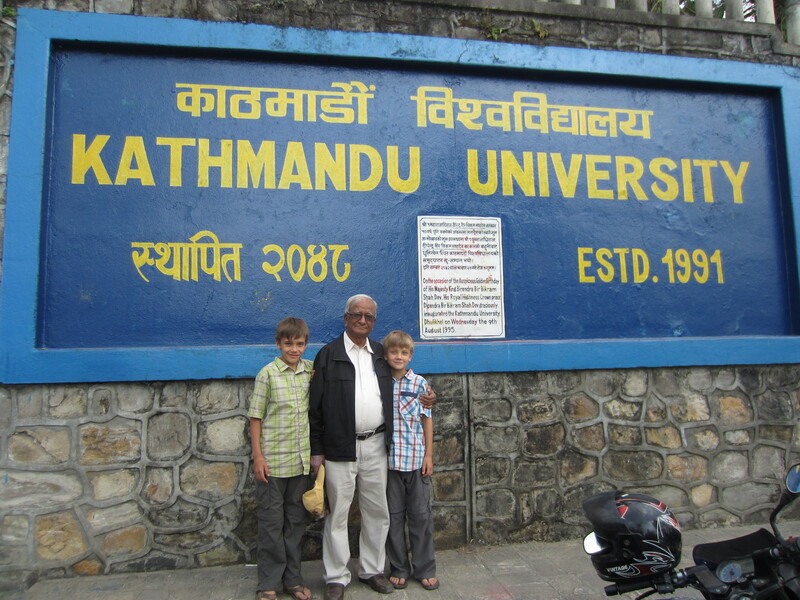 After Kathmandu University had been up and running for several years, B.P. realized that very few students coming out of the Dhulikhel secondary schools were being accepted to Kathmandu University. Those students were simply not prepared for college, the director of admissions told B.P. B.P.’s next stop was improving the elementary and secondary school system of Dhulikhel enough so that some of those students could advance to Kathmandu University. Not surprisingly, given his previous track record, B.P. succeeded again. We toured several of B.P.’s favorite successes and enjoyed his stories of how they came to be and of what was next on his to-do list. His determination, perseverance and patience were impressive. For us, the important lesson was that with vision, commitment and follow through real change can be made, even in a country as poor as Nepal (per capita GDP approximately $600, lower than Haiti, slightly better than Afghanistan, but worse off than every other country in the world outside of Africa).